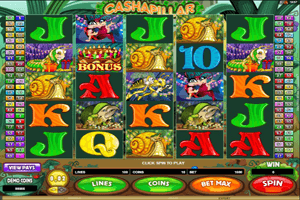 Cashapillar is a 100 paylined video slot machine that is about a unique caterpillar that gives a lot of payouts and this is why Microgaming has decided to name the video slot machine, the Cashapillar. Players will quickly notice that the game is themed around a caterpillar as the entire interface of the slot machine is dominated by green, the color of nature as well as different caterpillar symbols that appear scattered on the lines and the five reels of the slot machine. Apart from the caterpillar symbols, players will find other insects that appear spinning on the game’s reels and lines. All of these symbols come in wonderful graphics, which is not a surprise since the game is powered by none other than Microgaming, which is a gaming developer that is known for its top performing games that come accompanied with great winning chances. The winning chances that are offered to players at this game include the 100 paylines, which means players have 100 chances of getting a winning combo in order to get paid. There are also special icons and symbols that can also reward players greatly. There is the Cashapillar logo which is a multiplier and a wild symbol. It will substitute for other symbols while doubling all payouts it creates. There is also the bonus symbol that can trigger up to 15 free spins when at least 3 bonus symbols land on the reels.